At present, Bill C-304, the freedom-enhancing bill sponsored by Mr. Brian Storseth that seeks to repeal the censorship powers of the Canadian Human Rights Commission and Tribunal is under review in the Senate of Canada. The Bill passed through the House of Commons relatively easily and moved on to the Senate. That was (at time of this writing) 344 days ago. As we reported back in February, Bill C-304 is still languishing there in the Senate, stuck at the “second reading” stage. 1. Below is the background on Section 13, and a sample letter for Senators that you can copy and paste into your email program. We recommend that you edit the letter to make it as personal as possible. Then select the Senators that are in your province (see the list below for B.C., Alberta, Manitoba and Ontario as well as a complete list of all Senators). Copy their email addresses into your “to” field. Create your own subject line. Send off the email. Lastly, consider calling a few of them on the telephone and speak with them directly about this issue and why it matters to you! 2. 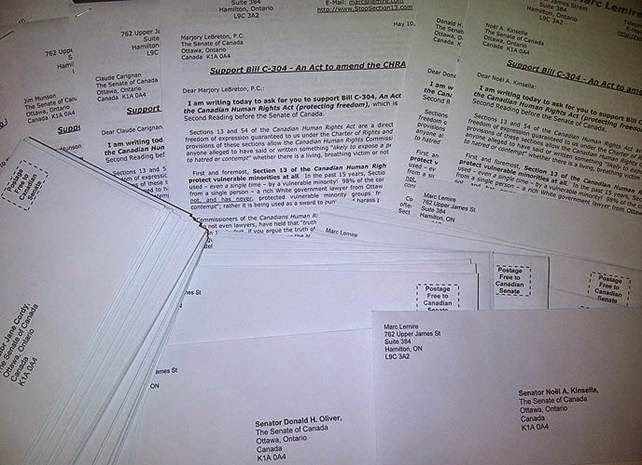 Below the Senate letter is a sample letter for the Prime Minister. Send that email to the Prime Minister as well, but also (and this is key!) follow up with a phone call afterwards. Just tell whoever answers the phone exactly what’s in the sample letter. That’s it! You’ve just contributed to the preservation of Freedom of Speech in Canada! Bill C-304, an Act to amend the Canadian Human Rights Act (protecting freedom) is currently at Second Reading before the Senate of Canada. This Bill will repeal the censorship powers from the misnamed Canadian ‘Human Rights’ Commission and strip their fanatical hold on Internet communications. Bill C-304 is necessary because Sections 13 and 54 of the Canadian Human Rights Act are a direct attack on the freedom of expression guaranteed under the Charter of Rights and Freedoms. (2. Everyone has the following fundamental freedoms: (a) freedom of conscience and religion; (b) freedom of thought, belief, opinion and expression, including freedom of the press and other media of communication) The provisions of Section 13 allows the Canadian Human Rights Commission to prosecute anyone alleged to have said or written something either telephonically or on the internet that is “likely to expose a person or persons to hatred or contempt” whether or not there is a living, breathing victim. The spirit of Section 13 of the Canadian Human Rights Act is supposedly to protect society's most vulnerable, not the least of which are racialized groups. (used to be known as "visible minorities") Disturbingly, 98% of the complaints from this section have come from an affluent government lawyer who is white. Would not members of such communities themselves be the ones using Section 13 most frequently if they genuinely felt vulnerable or even threatened? Is it not patronizing to have a white person chronically complaining; supposedly on their behalf? A recent Access to Information request shows that since the inception of the Human Rights Act in 1977, the Canadian Human Rights Commission (CHRC) has investigated over 100 complaints under Section 13 and accepted over 90%. A comprehensive review of all complaints shows the agency only targets “offenders” who can be categorized as “right-wing”. Those favoured by the CHRC - leftists, "social justice" and "progressive"-types - are shamefully allowed to play by a different set of rules. lousy kikes! they are always bitching about the holohoax. Hitler should have gassed them all and we wouldn't have this problem. same with the worthless gypsies. I believe no matter how or why you are a homosexual your life should be terminated… They should be terminated along with retards and any other degenerates that nature would do away with in the wild. Even worse is the investigative process directed against those charged under Section 13. CHRC Investigators possess no special training or education. Even worse is the breathtaking contempt they display towards the very "rights" they are bound by the Charter of Rights and Freedoms to uphold. In May 2007, Dean Steacy, the head internet investigator for the CHRC sneered during an Ottawa hearing that “freedom of speech is an American concept and therefore I don’t give it any value!” Is this the sort of person who should be entrusted with preserving our fundamental constitutional right of free expression? Sadly, this is typical of the mentality that permeates the CHRC. The CHRC believes that Section 27 of the CHRA, gives them a remit to censor any "offensive" material of which it does not approve, regardless of wherever in the world it might originate. Brazenly, it will even extend its long arm of censorship across the border into a country that understands free speech: the United States. The CHRC will badger large American Internet Service Providers (ISPs) such as QWest or AOL and demand they terminate user contracts for American citizens. (the CHRC clearly does not understand the First Amendment!) The head CHRC internet investigator even testified that the CHRC has attacked 200-300 websites around the world! Censorship is not be something that Canada should be exporting. Over the past few years, the CHRC's hubris has seen it behave similar to a National Security- type agency. Shamelessly, this politically motivated outfit operates in almost complete secrecy, with no rules, no public oversight and continually denies Access to Information requests on the absurd basis that they constitute a “security” violation." -Hijacking a private citizen's Wireless Internet connection and then posting on politically incorrect message boards with aliases for the purpose of entrapping and then dragging vulnerable dissidents before the Tribuinal. There wasn't enough "hate" on the Internet to be found so the CHRC had to bait people into saying things that it knew would result in complaints being filed. -Corrupt investigations of the CHRC have included dismissing a complaint because it was a “double-sided” fax. -Exchanging information with Police and others, thus usurping existing safeguards in criminal law. -Contravening the Canada Post Act by setting up mail drops in Ottawa to send out hate posters and receiving mail under false names. These and other reprehensible tactics have occurred because the CHRC is exempt from parliamentary oversight and also does not report to a minister. Instead, it proceeds as it pleases with virtual impunity. Inside the CHRC, there do not appear to be guidelines on how complaints should be investigated and nor would does it seem that the Commission's employees are bound by code of conduct. The corruption within the CHRC has reached the point where it is beyond reform. Sometimes institutions do things that are so atrocious they cannot be reformed. They can only have the relevant powers removed, as happened to the RCMP in intelligence matters, or be abolished outright, as happened to a Canadian regiment not so long ago. The Canadian Human Rights Commission should not be more insulated from accountability and responsibility for its actions than the Royal Canadian Mounted Police or the Canadian Forces. I call on this Parliament to assert its oversight role and to compel a full inquiry into the commission, its investigators, and their membership of Nazi websites, their conflicts of interest, their contamination of evidence, and their relationship with Richard Warman. Any legal system worth its salt should provide the accused with the ability to prove one's innocence. A system that results in automatic convictions accompanied with severe punishments has no place in a democracy. Sadly, this is what exists in Canada with the CHRC. Shamefully, since 1978 the CHRC has an obscene conviction rate of 100%. Is this indicative of either the CHRC's competency or its air tight cases against the accused? Hardly! The Canadian Human Rights Commission's system of prosecution is actually structured in a way in which the accused has little if any chance of escaping conviction. Making matters even worse for the accused is that what emerged from a precedent setting case at the beginning of the century: "truth is no defense." (intent or fair comment are also not treated as legitimate defenses). This means that an opinion expressed on the internet that happens to be factual, accurate or truthful could still result in a conviction if it is deemed "likely to cause hatred or contempt.” Those who have attempted to use "truth" as a defense have not only had it turn on them as "proof" of their guilt, but were also issued even heavier fines. What kind of democracy would allow any journalist, author, Internet webmaster, publisher and private citizen in Canada to be punished for telling the truth? The CHRC also routinely ignores other principles of fundamental justice such as the rules of evidence while allowing hearsay evidence. What chance does an accused have when facing a Kangaroo court that acts as a risk-free and taxpayer funded weapon to silence Canada's social heretics? The questionable ways of the Canadian Human Rights Commission were even noticed by its own hand-picked expert Richard Moon of the University of Windsor. In a 2008 report he wrote “The first recommendation is that section 13 of the CHRA be repealed, so that the CHRC and the Canadian Human Rights Tribunal (CHRT) no longer deal with hate speech, and in particular hate speech on the Internet." as a progressive human rights organization, we recognize the misuse of this section and the hardships it has brought to individuals. Therefore, at this moment, we support the repeal of the section. We want to make it clear that we come with a heavy heart. We do not come to the decision lightly. But based on our expertise and the expertise of numerous human rights activists across the country, the time is right for change. It is high time that the shamefully partisan and authoritarian Canadian Human Rights Commission be abolished. Last June, the House of Commons passed a private Member's Bill, Bill C-304 which repealed Sec. 13 of the Canadian Human Rights Act. Sec. 13 had been a vague and much abused form of Internet censorship, making an offence out of views expressed over the Internet that were not criminal. Truth was not a defence. Intent was not a defence. The wording was vague -- communicating views "likely to expose" designated or privileged groups to "hatred or contempt." No harm had to be proven. In fact, it was not necessary to prove that anyone other than the complainant had ever even seen the post in question. "Contempt" would capture any negative criticism. Until the Marc Lemire decision in 2009, Sec. 13 had a 100% conviction rate. That alone should have set off alarm bells. People are frequently charged with murder or robbery or fraud and acquitted. However, there were virtually no defences under Sec. 13. Most of the victims of Sec. 13 complaints were poor and obscure people, unable to afford a lawyer. The long drawn-out proceedings were an abuse BY process. The investigators and prosecutors for the Canadian Human Rights Commission acted more like a political police than officials steeped in our tradition of fairness. When the lead "hate" investigator was questioned during the Warman v. Marc Lemire Tribunal, he was asked what weight he gave to freedom of expression when he was examining a website: "None," he responded, "freedom of expression is an American idea." Oh, really? The House of Commons was wise to repeal Sec. 13. I am writing today to ask for you to support Bill C-304, An Act to amend the Canadian Human Rights Act (protecting freedom), which is currently at Second Reading before the Senate of Canada. Sections 13 and 54 of the Canadian Human Rights Act are a direct attack on the freedom of expression guaranteed to us under the Charter of Rights and Freedoms. The provisions of these sections allow the Canadian Human Rights Commission to prosecute anyone alleged to have said or written something “likely to expose a person or persons to hatred or contempt” whether there is a living, breathing victim or not. First and foremost, Section 13 of the Canadian Human Rights Act does not protect vulnerable minorities at all. 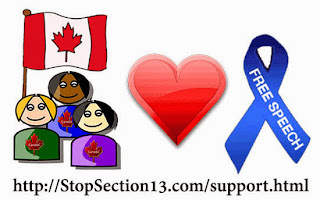 In the past 15 years, Section 13 has not been used – even a single time – by a vulnerable minority! 98% of the complaints have come from a single person – a rich White government lawyer from Ottawa. Section 13 does not, and has never, protected vulnerable minority groups from “hatred and/or contempt”; rather it is being used as a sword to punish and harass political dissidents. Commissioners of the Canadians Human Rights Tribunal, who are not judges and are often not even lawyers, have held that “truth” is not a defence against prosecution under Section 13. In fact, if you argue the truth of your statements, it is then used as proof of your guilt, and a rational to increase the amount of fines! Intent or fair comment are also not defenses. In fact, there is not a single listed defence under Section 13! Because of the lack of any defenses, the Tribunal has a 100% conviction rate since 1978. 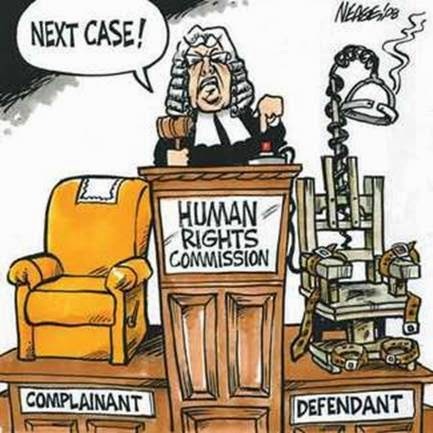 The Canadian Human Rights Tribunal routinely ignores the principles of fundamental justice, such as the rules of evidence, and these kangaroo courts, even allow hearsay evidence. Of particular concern is the ideological bias exhibited by the CHRC, which has led to arbitrary and capricious enforcement. Every single person brought up under Section 13, has been on the right of the political spectrum, white, and lacks the means to put up any legal defence. A whopping 90% have not even been able to afford legal representation. In May 2007, Dean Steacy, the head internet investigator for the CHRC sneered during an Ottawa hearing that “freedom of speech is an American concept and therefore I don’t give it any value!” At the CHRC this is not an unusual statement but rather status quo. 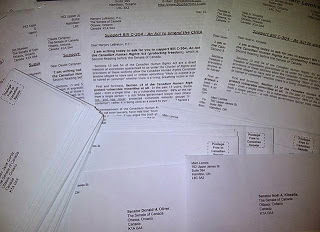 In 2008, after an appeal before the Federal Court of Canada, the Canadian Human Rights Commission was forced to reveal that staff of the CHRC had engaged in numerous nefarious activities on the Internet. This included having multiple memberships on neo-Nazi and virulently anti-Semitic websites, where staff at the CHRC would post comments online. Journalist Mark Steyn testified at the Standing Committee on Justice and Human Rights on October 5, 2009, during their review of Section 13 that “Sometimes institutions do things that are so atrocious they cannot be reformed. They can only have the relevant powers removed, as happened to the RCMP in intelligence matters, or be abolished outright, as happened to a Canadian regiment not so long ago. The Canadian Human Rights Commission should not be more insulated from accountability and responsibility for its actions than the Royal Canadian Mounted Police or the Canadian Forces.” Similar to the RCMP and Airborne Regiment, the CHRC is so discredited that it needs to go! I have made some shocking allegations against the CHRC in this letter, and am more than willing to provide detailed documentation on each and every point I made in this letter. I would like to have 20 minutes of your time to discuss Bill C-304 and why you should support the bill. Please let me know when is a good time, and we can schedule a conference call.